The trees that surround our house have sprouted small leaf buds. The birds are back. Each morning I wake to their enthusiastic trill as they scavenge in the grass hunting for their breakfasts. The robins returned first, hopping around, determined to locate worms in the damp soil, the earth newly released from a crunchy crust of snow. Gangs of small finches with yellow and green breasts flit over my neighbor’s alfalfa fields; mountain bluebirds alight on barbed fences. The woodpeckers have returned to begin this year’s carpentry projects. Tulips and daffodils unfurl in the front yard, splashing the dirt with pops of yellow, purple, and red. Grass sprouts again. My neighbor, Matt, has inquired if I’d like him to mow the lawn. I refuse to allow myself the hope that spring has arrived. Where I live, snow flurries and hard frosts are common, though thankfully not frequent, until early June. I’ve fallen sucker to springtime exhilaration too many times before. Though the birds and flowers seem to indicate otherwise, it’s only a matter of time until that next soul-crushing snow flurry cakes the grass with sticky, wet sleet. I think of the robins. In acquiescence to the unique meteorological attributes of our high desert town, I’ve started my garden plants in the ‘cold room,’ where we keep our washer, dryer, snow pants, hats, shoes, and a large freezer that we have yet to plug in. The cold room was added on to the house at some point in its nearly 100-year history, and, as the name implies, it is not connected to central heating and is therefore very cold. But it is the only space with sufficient west-facing real estate to capture the sunshine. (I have very little south-facing space, so the western aspect will have to do.) I heat the cold room with a small space heater and try to keep my herbs and plants alive through the long, taunting winter. I also use the cold room to start my garden. It is imprudent to put garden plants into the soil outside until mid-June. The risk of snow is too high. Last year, my tomato plants died. We transferred healthy, little plants into the raised beds in the front of the yard, where they received the full warmth of the sun all day. They budded small flowers, and then, despite the sunlight and copious water, the leaves yellowed and slowly withered. I could not save the plants. I was heartbroken. Several people consoled me, saying that it wasn’t my fault. It was a bad year for tomatoes. Ghosts of the tomato plants haunted me all summer. Thank goodness for the Farmer’s Market and for a friend, whose cherry tomatoes proliferated and who graciously offered to share her bounty of yellow and red jewels. A tomato plant is a garden’s delight. I adore the scent of tomato leaves as I peek in search for new buds, prune the existing buds to ensure even, sustained growth, and monitor the small fruits that replace the buds. I love the heft of the young tomatoes in my hand, the sun-warmed flesh. I feel like I’ve won the lottery each time I pick the ripened fruits, making a basket of my shirt to squirrel them into the house. Garden tomatoes are nothing like their cardboard counterparts at the grocery store. Garden tomatoes are unparalleled in flavor, sweetness, and juiciness. They provide the ultimate umami. I’m not taking any risks this year. I’ve planted San Marzano seeds in organic soil beds in an old egg carton. I placed extra pots in every available sunny spot in my house. I also bought a tray of the La Roma II variety, started at the hardware store. Their thin stalks bow to the afternoon sun. I planted sweet, organic large-leaf basil; rosemary; Greek pepperoncini; jalapenos; sweet peppers; cilantro; radishes; sunflowers for Rory; and, in extreme defiance of the short growing season, crimson sweet watermelons. The sunflowers, summer’s statuesque revelers, have already started to sprout. The proto-garden sits atop the freezer and waits for the western sun. 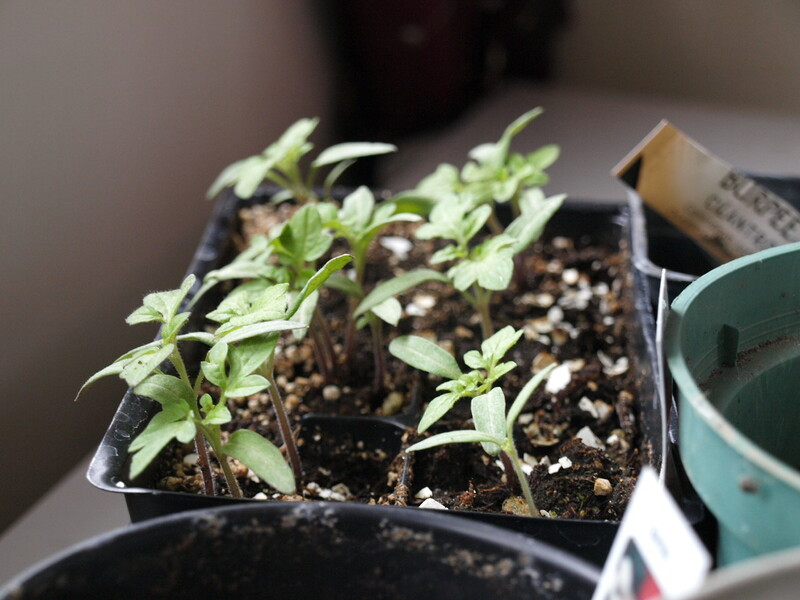 I whisper to the tomatoes: Please, please grow. I can’t bear to spend another year without you. The sight of the robins bolsters me. I consider their beauty as I pull weeds from the front yard: their bold orange breasts, the pale rings that line their black eyes, the mottled flecks of their delicate blue eggs. It’s difficult to resist the allure of anthropomorphism. Though I know the robins hop by dint of biology, they seem so cheerful, so determined… but in an amiable way, like cheerleaders for Team Spring. I grew up in a Brooklyn neighborhood where the buildings and streets were dirty and gray. Green spaces thrived in the care of others: honeysuckle, fragrant and sweet, twined on fences in Seagate; tree-lined Ocean Parkway, dense with flowers and leaves in springtime; and Asser Levy Park, where my mother and I ate piroshky after long mornings of grocery shopping on Brighton Beach. My apartment building grew no gardens, and I certainly didn’t have the opportunity to work the soil myself. Cultivation is new to me. This summer marks my fourth year of gardening education, and, though my firsthand knowledge has improved greatly, every year I learn more. The plants teach me their visceral secrets. I think of my childhood as I huddle on my knees, grasping for the renegade weeds in the farthest reach under the thorny shrub by my front door. The younger me had no idea that this is where she would find herself: on her knees in the dirt, cursing stray branches and looming wasps, surrounded by robins rooting in the grass. She didn’t know what it meant to provide care to other things, much less raise them. But, as she checks the moisture in the pots, switches on the purple UV light, and peers lovingly over her plants while tucking her green babies in, she allows herself a brief moment to believe that somewhere amidst the soil sprouts a tiny seed of optimism.